This post is also available in Bahasa, Portuguese and Spanish. Which of the world’s forests are natural, and which have been planted by humans? It seems like a simple question, but researchers have been struggling to answer it for years. Satellites can’t easily distinguish between primary and secondary forests, which occur naturally, and planted forests, which are created and managed by people to supply timber, rubber and other commodities. And few countries provide accurate maps of plantation locations. But we’re getting closer. Researchers from Global Forest Watch and Transparent World recently mapped tree plantations in seven heavily forested nations, and found that in most of the countries, more than 90 percent of tree cover loss is occurring within natural forests. That’s a problem since natural forests, especially those in the tropics, provide much greater climate, water and biodiversity benefits over planted landscapes. Loss figures calculated using a 30 percent minimum for tree cover canopy density. 1) Most Recent Loss Occurred in Natural Forests. 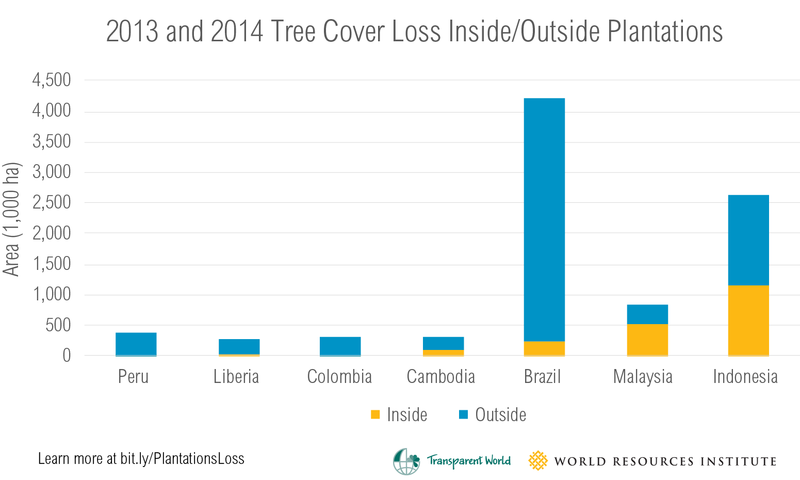 In Brazil, Colombia, Liberia and Peru, we found that more than 90 percent of tree cover loss in 2013 and 2014 occurred outside of plantations, in natural forests. This loss is much more devastating than loss in plantations, since natural forests support richer ecosystems and biodiversity. Tree plantations are established within an Intact Forest Landscape in central Peru. See it on the interactive map. 2) Plantations Are Replacing Natural Forests. Our maps tell a very different story in Indonesia and Malaysia, which together accounted for approximately 75 percent of the plantation areas mapped across the seven countries. Plantations cover almost a third (30.2 percent) of all land area in Malaysia, and 12.9 percent of all land area in Indonesia. The majority are oil palm plantations, followed by rubber. Unsurprisingly, these two top exporters of palm oil experienced the greatest percentage of total tree cover loss within plantation boundaries: 65 percent and 44 percent in Malaysia and Indonesia, respectively. That’s not to say the countries’ carbon-rich forests aren’t under threat. The two-decades-long presence of industrial-scale plantations has taken its toll on the nations’ Intact Forest Landscapes, the most biologically rich type of natural forest. In Malaysia, more than 24,000 ha of plantations are located in areas that were Intact Forest Landscapes in 2000; in Indonesia, that area increases to more than 66,000 ha. Even in Peru, where timber, oil palm and rubber currently cover only 0.1 percent of the land area, plantations are taking their toll. Over the past 15 years, more than 5,000 hectares of plantations were established in areas previously mapped as Intact Forest Landscapes. This reinforces concerns that new plantations will expand into natural forests of South America and Africa, as has happened in Indonesia. View this area on the interactive map. Much of the annual tree cover loss in Indonesia and Malaysia, visualized in pink above, is likely the harvesting of trees that were planted as of 2000—the farthest back data on Global Forest Watch goes—and not old-growth or natural forests. View this area on the interactive map. 3) Plantations Are Important—as Long as They’re Managed Properly. As global population and demand for commodities continue to grow, plantations will play a critical role in meeting those needs. But to ensure a sustainable future, policymakers and other stakeholders must balance such development challenges with environmental priorities, including reducing emissions from deforestation. For example, future plantations should be established in already degraded land and avoid high-conservation-value natural forests. 4) It’s Important to Keep Distinguishing Between Natural and Planted. Maintaining this data set is particularly important for helping policymakers make the best land-use decisions, and for understanding how tree plantations expand and contract within each of these tropical countries. However, given the variety of planting patterns and tree species within each plantation, it is still difficult to distinguish between types of plantations—or even plantations from natural forests—using even the most advanced remote-sensing technology. For now, we rely on human analysis. The increasing availability of high-resolution satellite imagery, decreasing cost of computing power, and the advancement of analysis methods, along with increasing transparency among governments and companies, should hopefully decrease the time and money required to update and scale these maps in the future. LEARN MORE: Explore the data on an interactive map or read the Technical Note.